We are pleased to know that you’re visiting our town Bulan. May your visit be a memorable and fruitful one this time. Since your purpose is to discuss the Pawa hospital issue with Mayor Helen De Castro, the Bulaneños at home and abroad are already excited about the upcoming results of your talk. The Pawa issue is not only a local issue, it is an international issue for Bulan expats all over the globe are concerned about it and are monitoring closely the developments especially how the concerned authorities are tackling the problem. Pawa Hospital is a big problem in Bulan. We can only hope for positive results this time, which means that something concrete must be done right after your discussion to the Pawa Hospital that would lead in a short time to the renovation of the building and upgrading of the hospital and medical facilities. That’s the basic- and the most important. Once renovation and upgrade of all facilities has been done, Pawa Hospital will become attractive as a working place for medical personnel such as doctors, nurses, technicians and office workers. 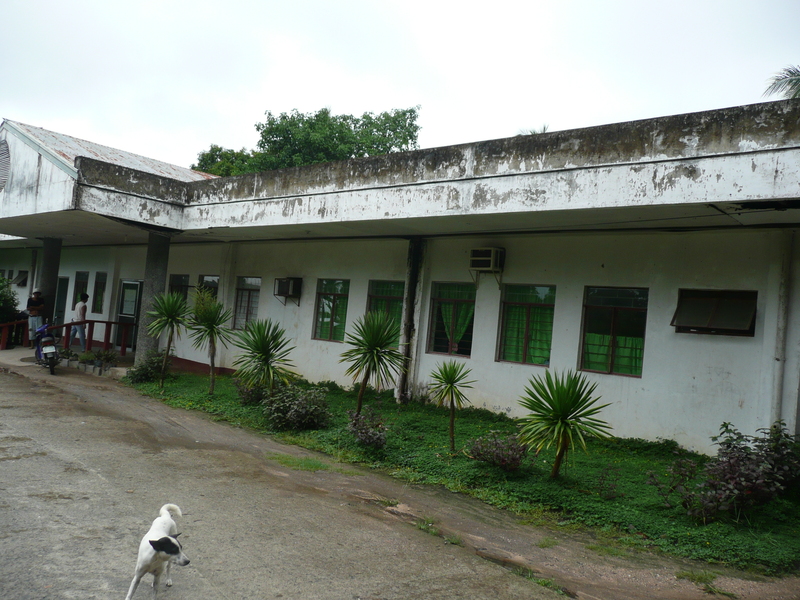 The Pawa Hospital’s present condition is very desolate so we should not wonder why it doesn’t attract local medical personnel to apply for open positions. The market in this area is highly competitive everywhere in the world. Hence, if closing the Pawa Hospital- or of transforming it to a PNP station- is not an option since the expanding population of Bulan desperately needs Pawa Hospital for their basic medical needs and security, there is categorically only one option left for us which is to renovate and upgrade it and make it attractive. This is the only way. Therefore, since you are politically directly responsible to Pawa Hospital, we ask you to exhaust all your available means afforded by your office to upgrade Pawa Hospital and support the local government of Bulan in all its efforts to maintain Pawa Hospital. This time, the COA (Commission On Audit) will surely not make it difficult for you if the provincial financial resources are truly spent in a great project like Pawa Hospital. The people of Bulan would be happy if they don’t lose Pawa Hospital and would trust their leaders ever more if they could solve this problem. That would be the biggest gift to the people of Bulan. We thank you for visiting Bulan and for all your efforts for the Pawa Hospital. We will be closely monitoring the developments in Pawa. Jun, I think it’s about time that your readers be informed about the PAWA HOSPITAL which has indeed been the source of so many hurt feelings and complaints from our residents. I myself felt the same especially only a few weeks ago, some of my relatives who were supposed to be treated there has to go to Irosin District Hospital for their medical needs. Mayor Baby told me to write you and inform your readers about the true situation of the PAWA Hospital. Mayor Baby has been very concerned about the situation although this is not within her ambit of administrative responsibility, since Pawa is under the provincial government. She knows that ninety nine percent of the patients are Bulanenos. But she says she does not want to point fingers at anybody because she has also known of the concern of Governadora Sally. The problem with PAWA HOSPITAL is the lack of doctors. 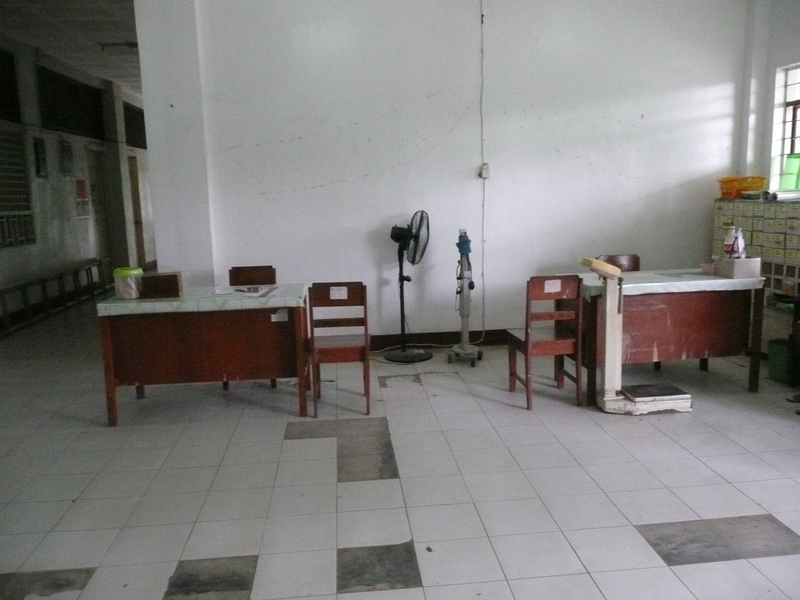 AND EVEN IF THERE IS A VACANT ITEM NOW OPEN FOR ANY DOCTOR TO APPLY FOR, THERE ARE NO TAKERS! The reason? Medical practitioners shy away from a government position because of the low salary na talagang dire mo man puwede ikabasol sa mga doctor ta. Most of them are in private practice po. But the provincial government cannot appropriate salaries more than ordained by law. Nano tabi an inhihimo ni Mayor Baby san Problema sa Pawa: Mao tabi ini. Seguro po dire aram san iba nato na mga kabungto, na an duwa na doctor doon sa PAWA is already being shouldered by LGU BULAN. DR. James APIN and Dr. Bernard SAN JOSE. 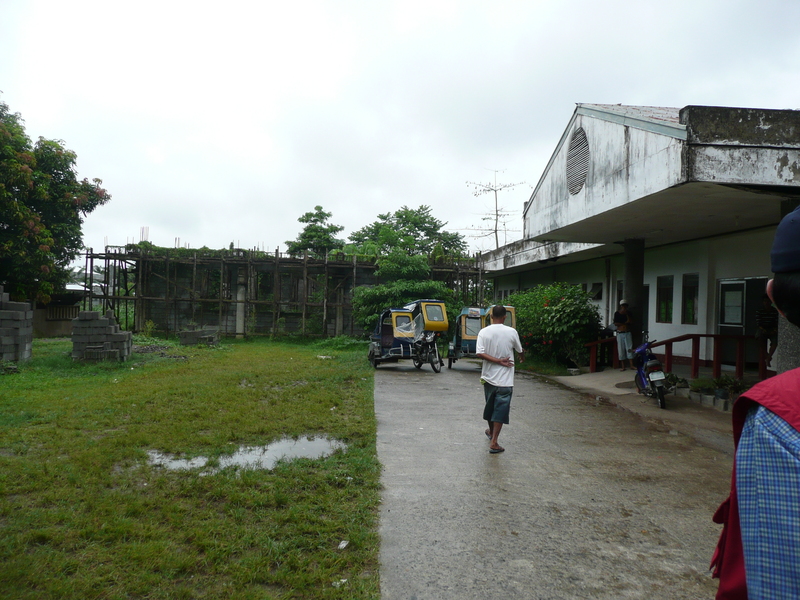 An Pawa po has only one resident doctor before. Mao po ini an mga nagsurunod, si Dr. Monina Luzuriaga. When Dr. Luzuriaga retired, Dr. Gordola was assigned there, then she went into private practice. Dr. Lustestica of Prieto Diaz came, then he was transferred. Then Dr. Tita Palad. During all these time, that one single doctor did all the work at PAWA!!! Imagine one doctor working 24/7! Even the nurses and attendants cannot afford this difficulty, not even if he is a superman. Mayor Baby and Governor talked with each other last year and the Province added another item for PAWA. That should have made it two doctors. Meanwhile, didi man sa Local RHU nato, because of the increasing demand for medical services, Mayor Baby added another item for local doctor. Kaya si Dra. Payoyo of Irosin nagkaigua sin kadanun in the person pf Dra. Kates Rebustillo. We also filled up another dentist item, Dr. Mariel Rebustillo, but Dentist Mrilou Jimenes also died last year kaya sayo na naman an dentist ta. Sa PAWA, may position open for applicant -doctors pero wara sin nag-aaplay. Kaya solo permi si Dra. Palad san trabaho niya. In fact, didi na siya nag residence muna. Pag Saturday, Sunday wara doktor, kaya an hinimo ni Mayor, naghimo paagi na ma-hire temporary every Sat and Sun lang sira Dr. Apin and Dr. San Jose. So that solved the week end problem.In fact Mayor was even scolded by COA for giving honoraria to the two doctors which are not supposed to be because it is against the law!! Imagine this situation. Pero Mayor reasoned out that it is for PUBLIC WELFARE that she is doing it! Mayor Baby continued to have these two doctors serve Pawa. NOW… here comes again the problem. Dr. Tita Palad was shuffled to Sta. Magdalena, and a new doctor was assigned to Bulan, Dr. Pierre Ayuban. But you know he is from Camarines Sur. And he has to travel all the way up and down here also because he has a family out there in Camarines. He comes on time alright, but his assignment is by schedule, Monday afternoon to Wednesday afternoon. That leaves Wednesday evening to Friday afternoon with no doctor again!!! Also, Sunday evening to Monday morning there is no doctor because Dr. Apin and Dr. San Jose has to go back to their original posts!!! Kapagal! At this time would you believe that Dr. Ludovic Tan of Irosin Diostrict is our in-charge? He has to oversee two hospitals all at the same time!!! Governor Sally Lee requested one doctor from outside of Sorsogon to come to Bulan, but after about a month or two, dire na nag-report kay mapagalon daw sa kamutangan niya. Again, pan-o mo ini mabasol? Kaya an mga pasyente ta sa Pawa may mga time na dire naatenderan san Doctor. May nurses, may attendants pero pan-o man kun wara doctor! Sa Bulan liwat we are already 96,000 people as of latest count. Pero sa RHU wara kita problema. Governor and the Provincial Health Office is very much concerned. Pero maski ngane sa Provincial Hospital, an iba sa alley na nakahigda. Grabe talaga an kaipuhan ta. Kaya ngane pag wara doctor didalagan na lang sa mga private clinic o kaya pa Irosin o kaya paRHU. An problema kay kun kawaraon ini na mga tawo. An ihimo na lang san mga pobre ta na kabungto dalagan sa MSWDO, o kaya sa Opis ni Meyor. which we attend to with great passion. WE ARE CALLING UPON ANYONE WHO KNOWS ANYBODY WHO WISH TO APPLY FOR A POSITION AS DOCTOR SA PAWA. The item is there, will somebody take it please? Tama man an sentimiento san sayo mo na reader, angay suon pasirahan an PAWA. Pero, dire man ada tabi puwede kay kaipuhan ta gihapun. Last year, I was informed by Bokal Hao that the Head Nurse in Irosin went abroad because the pay there is better. Of Course , nobody can blame them because they have a family to raise po. But we in the Local Government, lalo na si Mayor never tire out of trying to figure things out and look for solutions to the problem of Pawa, even Governor Sally also. I think, she is planning a visit one of these days. The Local Government Unit has a Health Program, please check it out once our website comes out October 1. Also, we intend to purchase a mobile laboratory this year to reach out to our farflung barangays. Mayor has seen to it that there is now a maternity clinic in Otavi and Obrero. These are now operational. The BHWs are very active. Pero talagang dako na an Bulan, and we are adjusting to it. Even our local ambulance is kept almost busy every day. There are times when our ambulance has to bring in three patients in one single day. Our ambulance driver Tio Nani just passed away a few months ago, and to us he was a real hero, serving our patients even in the middle of the night or early dawn. Next year Mayor wants to have a bigger RHU complete with lying -in clinic. You see po, we can only do as according to our municipal budget. But we continue to source out sponsors like World Vision, PhilCAT, Center for Health Development, the DOH,the DSWD so we can provide for more for our people. And also from the positive side, sa tutoo po mga mayadun man an mga personnel ta sa Pawa. I find them very friendly an dedicated. Un nga lang may mga time na seguro dahil kun minsan surunod sunod an pasyente lalo na kun gab-i may mga nagiging grumpy kay kun piraw na. Pero by and large they are wondeful people doing their jobs with passion. I can personally vouch for them because I had my two baby girls delivered sa Pawa Hospital. Even my brothers had their kids delivered in Pawa. When my Papa was hospitalized until he died in Pawa due to a really incurable emphysema, the doctors and the nurses were very warm and accomodating, and they emphatized with our pain and sadness. And I know there are hundreds, if not thousands, of other people who were served well in Pawa and by Pawa. It is only unfortunate that the problems are present. In a life and death situation, you cannot blame people with how they feel especially when indeed when it is time that the services are needed most they are not there! I can only empathize with those who were brokenhearted because of the day when they needed Pawa most and there are no doctors. If I were in their shoes I will feel the same anger and hurt. But, at the same we wish to assure the good public of Bulan, the very people we are serving that our Mayor and Gobernadora are doing the best they can to help alleviate the sufferings of our poor people who depend on Pawa. We are not offering excuses for whatever lapses there maybe. Nor can we resurrect back those who may have gone through fatal moments just because of the few minutes or seconds that were lost just because there was no one to attend to them at PAWA. PAWA Hospital is our primary and priority concern because of what is happening now. Two days from now, Mayor De Castro, Governor Sally Lee and the hospital staff will come together to talk about what is happening in Pawa. We shall keep you updated po. Now. This year we just won the Best Brigada Ahensiya search in the Bicol Region. The award is given to an agency that has initiated and nurtured a program or project. We have the ecopark for an entry. The Mayor’s staff decided that after we have received the Brigada award , we shall focus to another project– this time to Pawa Hospital. We shall plan out schedules so we can help there the undermanned janitorial staff to spruce up and beautify the physical facilites of Pawa. This is our way of contributing whatever we can for Pawa. The Liga ng Mga Barangay donated 12 units electric fan to Pawa from 14,888 pesos we solicited during the barangay night. We shall have it installed anytime now. Thank you for reading this. And thank you for your understanding. Indeed, PAWA is a concern to us and we are doing something for it, but closing down Pawa Hospital is out of the question po. My email and open letter to the president of the Philippine Hospital Association (PHA). I come from Bulan, Sorsogon, Region 5 and also would like that our Pawa Hospital not be forever forgotten and left behind but be part of that Big Leap. I am not for strengthening our hospitals of the future but of the hospitals that exist today. Pawa is a member of PHA and has been around for many years already but it hasn’t improved since its establishment but deteriorated. It is very weak and very sick and requires strengthening now! -the building has never been repaired as it looks dilapidated, dirty façade and moldy walls both outside and inside, dark corridors and broken floors, very poor illumination, dirty toilets and generally very poor sanitary hygiene. Indeed, by modern standard, it is a ruin but still continue to admit patients. -the medical facilities and instruments are practically missing, even the most basic ones like stethoscopes, blood pressure gadgets are very limited and partly defective, etc. 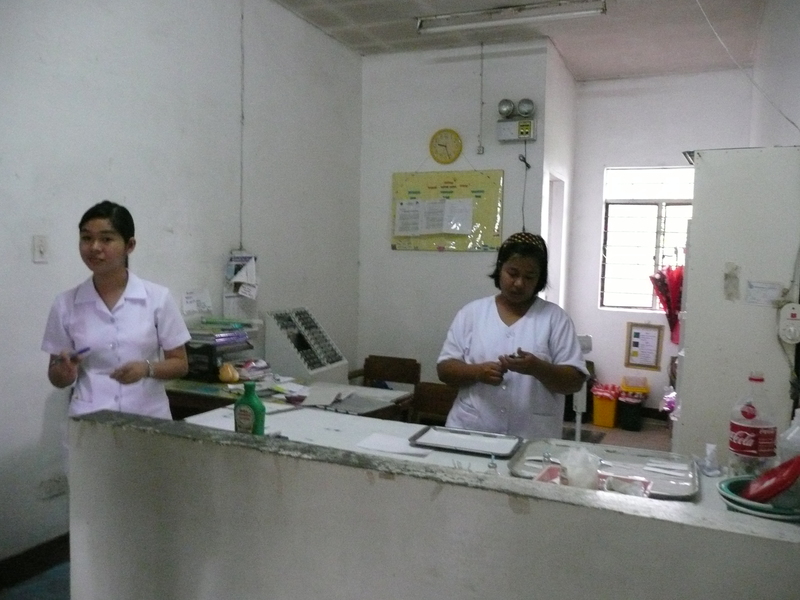 Yet, the medical personnel of Pawa are willing to work and continue helping their patients. But as we know, the lack of the right instruments and medicines and the very poor facilities limit also the capacities of medical workers no matter how good and willing they are. Our local government has done something to increase the number of medical doctors in Pawa and help where it can. 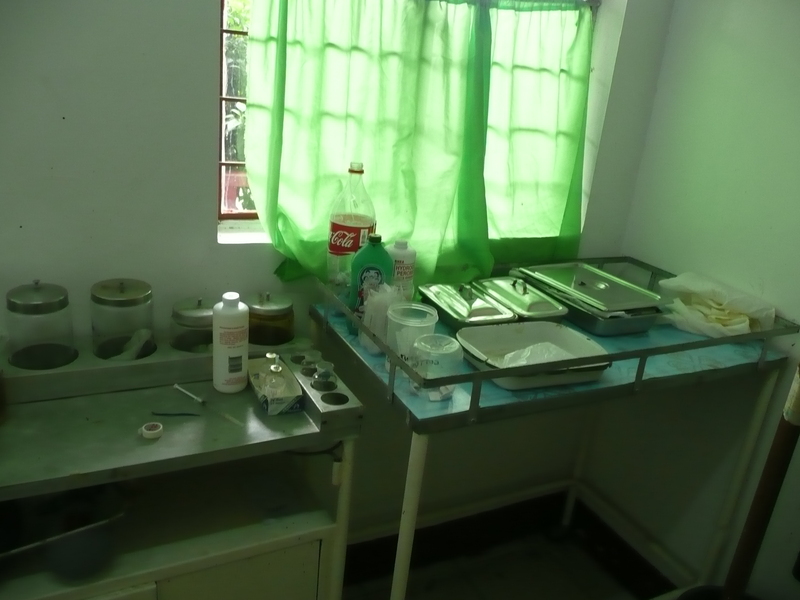 But technically, Pawa Hospital falls on the provincial responsibility, hence the LGU Bulan does not receive or does not possess the allocated budget for the maintenance of Pawa Hospital. The photos I posted will speak louder than words. And should you come for a visit to Pawa Hospital you would- as a healthy person- hesitate to get inside in the interest of your health and hygiene. This would be understandable. You in turn would understand then what a sick patient has in mind being delivered in Pawa Hospital for “treatment and recovery”. I ask you in your capacity as PHA president to do something for Pawa Hospital that would bring Pawa to public consciousness and to governmment authorities directly responsible for this hospital and, last but not least, to any activities that would bring in financial resources for its repair or renovation and for the upgrade of its medical facilities. I thank you for your attention and for all the efforts you will be undertaking for Pawa Hospital. At first glance, you might think this is a deserted military camp. 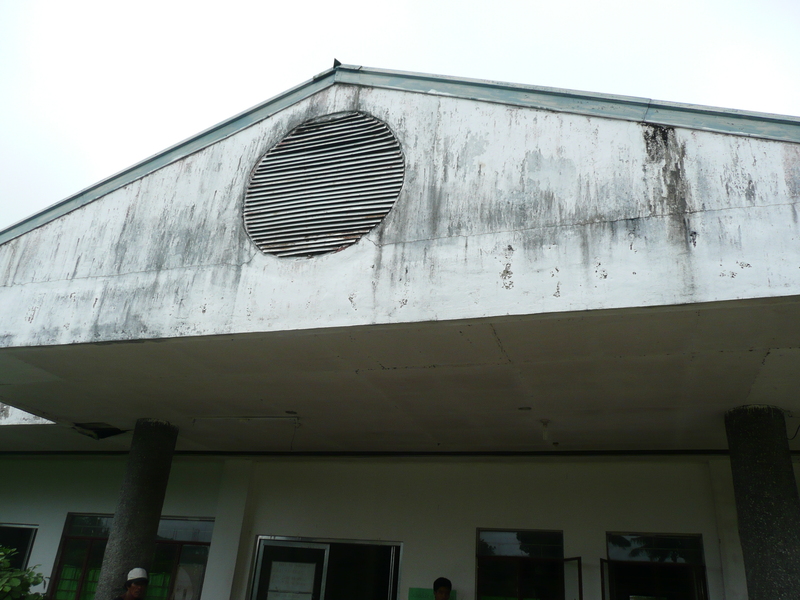 But this is a hospital, the Pawa Hospital in Bulan. Young and friendly nurses at work. They deserve a cleaner and modern hospital to work to. Admission room? No computers, not even a type writer. 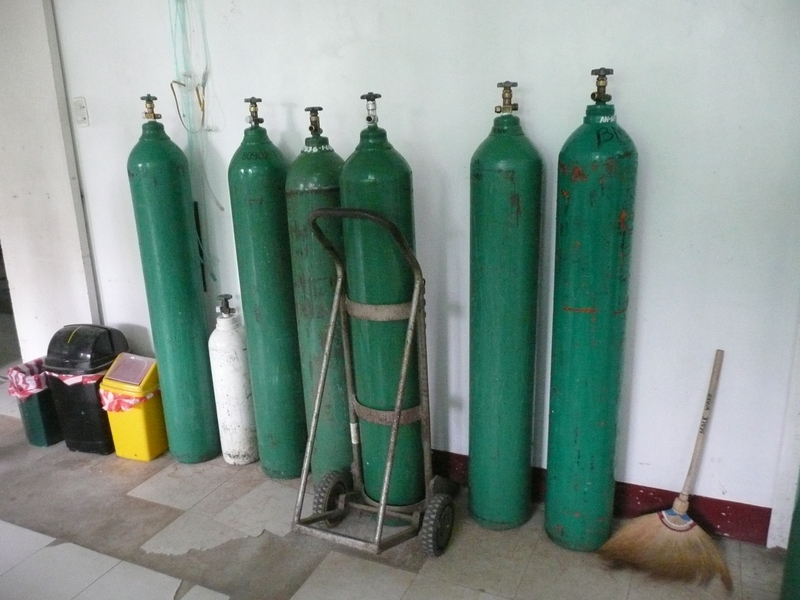 Oxygen tanks, perhaps empty, beside trash bins and broom. 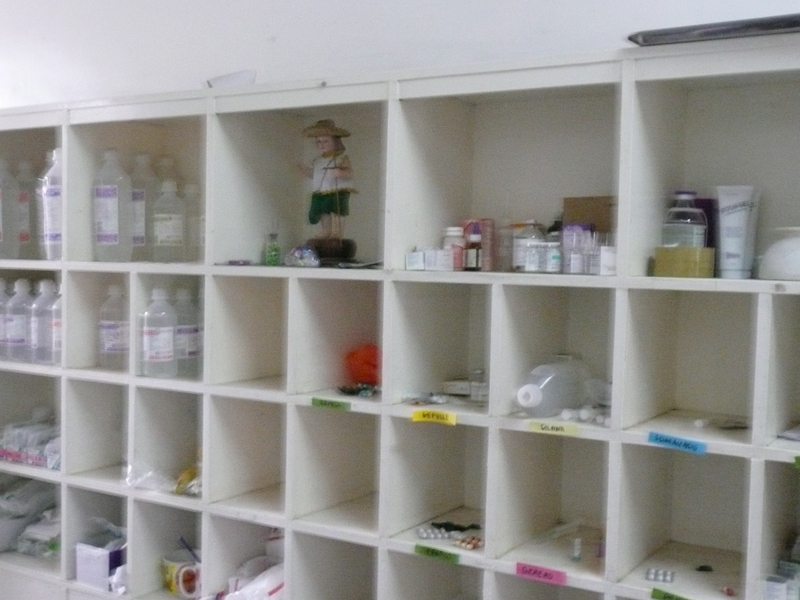 The very minimal medical materials, lacking medicines. Yet, a newly born Pawa baby. Pawa Hospital should be improved and upgraded so that it can serve our people better. Let’s create a forum to discuss ways how we can help and eventually create an aide scheme. I have created under Categories on the right the Pawa Hospital Forum for this purpose.